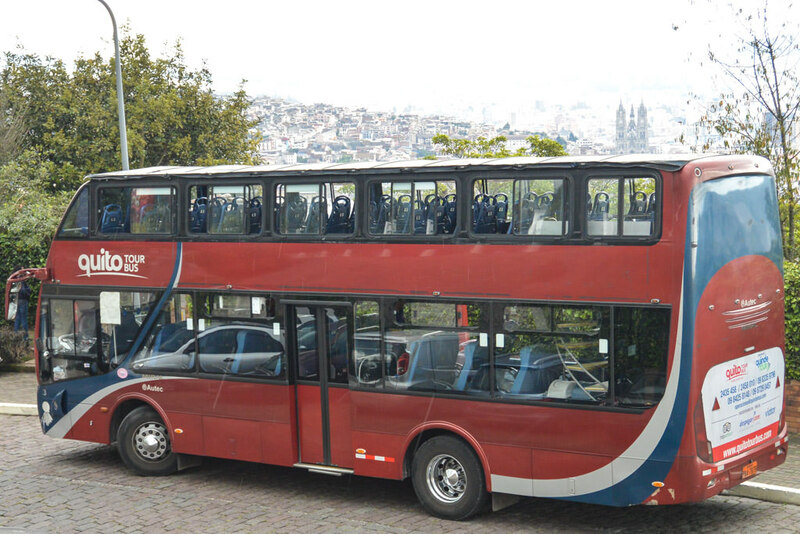 Make the Most of Your Time in Quito with the Quito Tour Bus! Buses tend to be the most inexpensive form of transportation in most countries, and I’m all about doing things cheap if possible. If you factor in time waiting around, flight delays, and dealing with security, taking the bus can also be the most relaxing and maybe even most time-efficient method of transport. This goes not just for intercity and cross-country transport, but also for getting around within a city. Recently, I’ve become super obsessed with tour buses, especially the open-top, double-decker kind. I first tried the Hop-On, Hop-Off Bus concept in Rome, and then again in Mexico City, loving it both times. 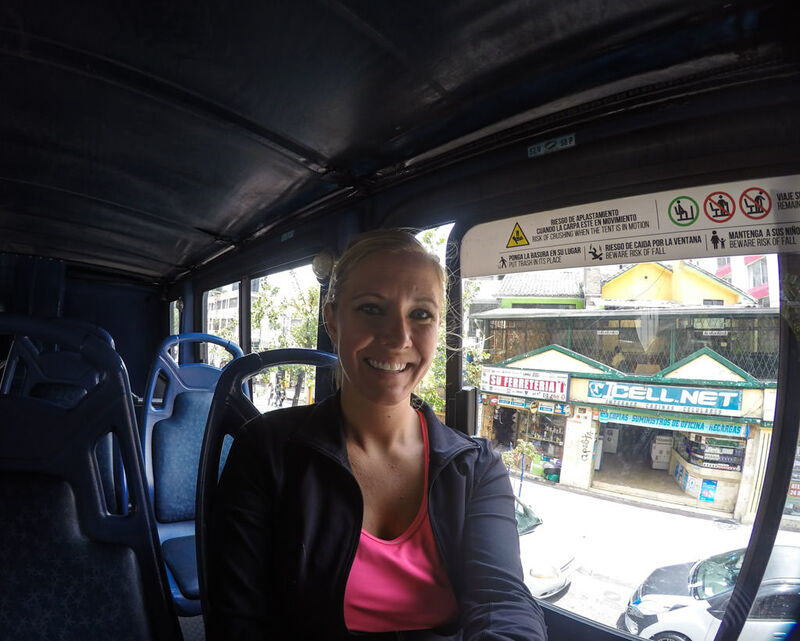 It’s an awesome way to see the main attractions of a city (and some lesser known spots as well), as well as being a cost-effective and easy way to get around. Since then, I’ve searched out tour bus experiences in every major city I’ve visited, and my visit to Quito was no exception. 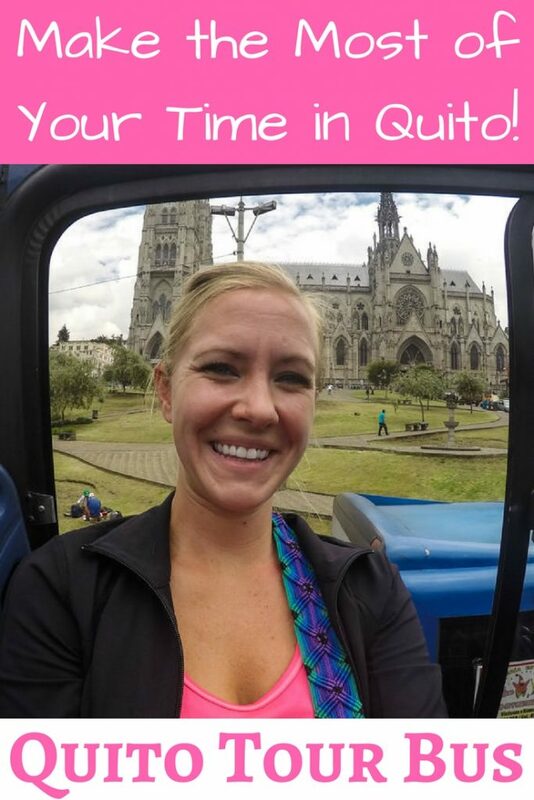 I checked out the Quito Tour Bus, part of the Quito Bucket Pass, and absolutely loved it. If you are feeling a bit sketched out, taking the Tour Bus is a very safe alternative to wandering around “on the ground” or even hailing a cab (which provides its own unique set of dangers). 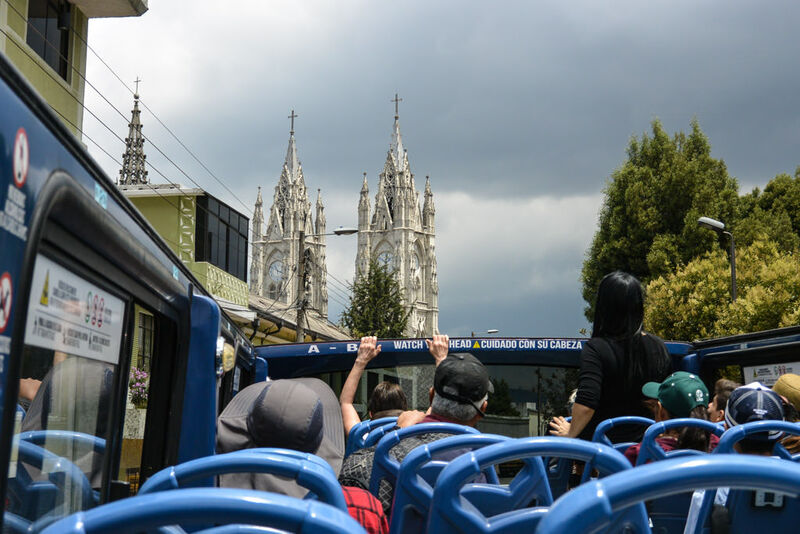 The Tour Bus includes a 30 minute stop to the major attraction of El Panecillo, which is surrounded by an area that isn’t known to be the safest in Quito, especially if you’re walking up to it. The Tour Bus navigates through several different neighborhoods (including the most popular La Mariscal and Historic districts), allowing you to get a varied perspective of the city, and hopefully adding to your comfort level. 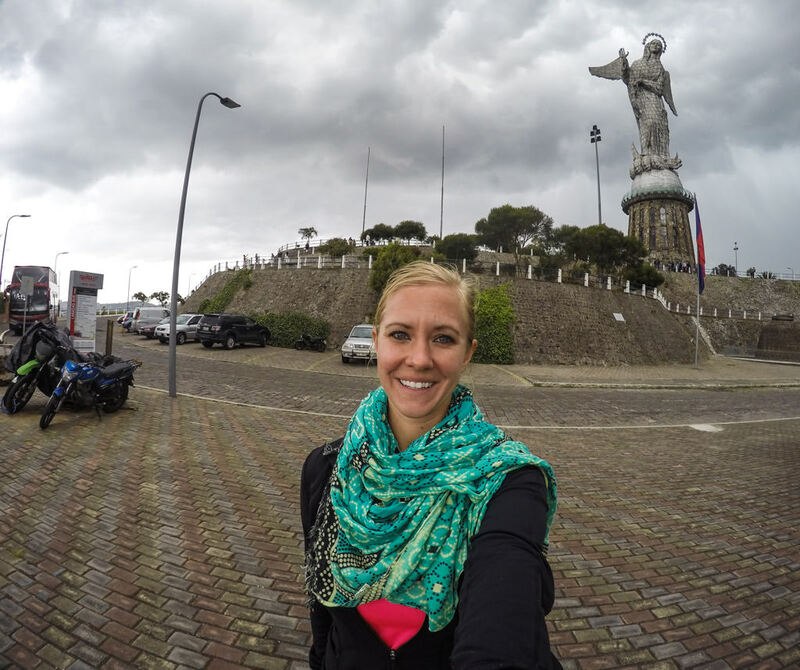 The Quito Tour Bus is so much more than just simple transportation. A narrated description of the major sites (and sights) is provided in several different languages, including English. The Tour Bus provides basic (cough cough quite slow) internet access via wifi, allowing passengers to look up information on any sites that pique their interest… or maybe to just catch up on Instagram. There are two strategic places to start your trip on the Tour Bus, located in the most popular tourist areas. You can buy your ticket at your hop-on point, or online (but you’ll still need to go to one of the hop-on points to activate it). In La Mariscal area, you’ll need to activate your ticket at the intersection of Av. Naciones Unidas y Shyris, parque La Carolina, Norte. If you’re in the Historic Center, like I was, you can activate it at the “Quinde” store on the corner of the Plaza Grande (the intersection of Venezuela and Espejo streets). Buses leave every hour (schedule here) and the total tour (without any hop-offs) is about three hours. I found the bus to be quite timely, even during heavy traffic. It can be hard to see all the sights in a big and spread-out city like Quito, especially if you only have a few days (or less!). With the Quito Tour Bus, you can see a lot in a short time. It is perfect for anyone with a limited stay in the city who still wants to make the most of it. 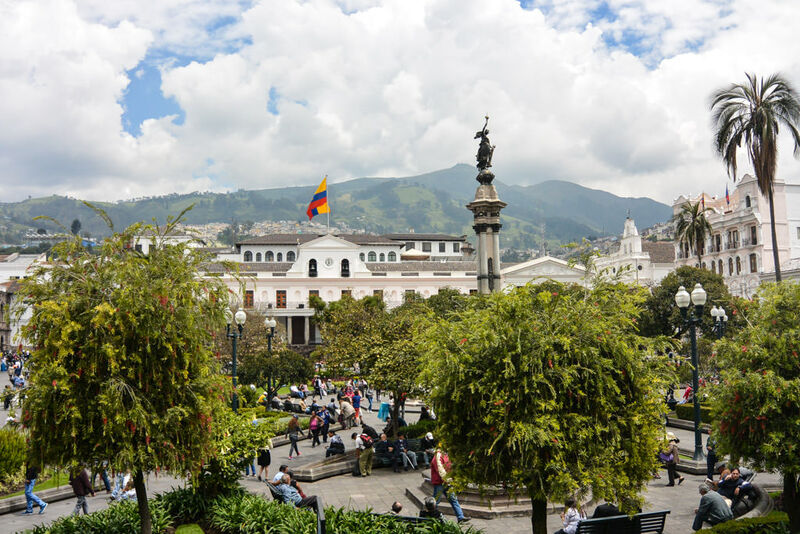 You don’t need to worry about hailing cabs to and from the main attractions, or even doing research, as all the work is already done by the staff of Quito Tour Bus. Because it passes all of the major sights, the Tour Bus is also perfect for people who love photography (like me!). While I wasn’t too short on time in Quito (I had 5 days), I still used the Quito Tour Bus to my advantage, by riding it on the first day to get a lay of the land and scope out places I wanted to visit. in my Hotel Carlota room, ready for the tour bus! The weather in Quito changes very, very quickly. I went from wearing feeling cold in a sweater and rain jacket to sweating in a tank top in less than 15 minutes, and back. Especially if you’re sitting on the top of the bus, the sun gets intense! I was shocked to find that I had a sunburn after my 3 hour ride. You’ll want to hold onto your bus pass, as you’ll need it to get back on the pass if you hop off. Every now and then when the sun actually comes out, it’s quite bright. You want to be able to actually see these attractions from the bus, so don’t forget your sunglasses. When it rains, it pours in Quito, and I was caught in more than one downpour on an otherwise beautiful day. Don’t go out without your rain jacket, or buy a cheap plastic poncho to keep in the bottom of your bag. 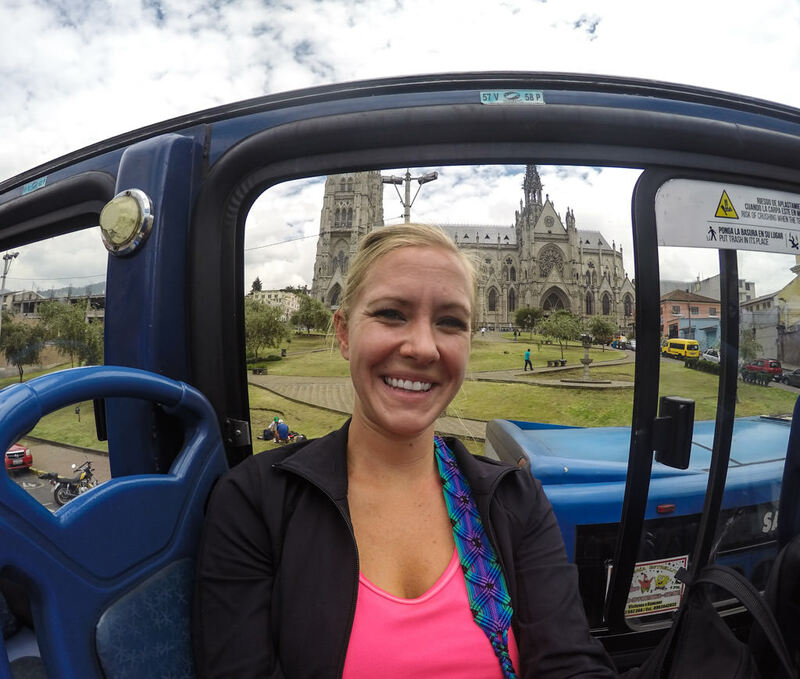 Whether you use your phone as a camera or you go for something a bit more heavy duty, the Quito Tour Bus provides plenty of snap-worthy opportunities. Unless you want to hop off, you’ll get thirsty at some point in the 3 hour ride on the Tour Bus. How do you feel about taking buses to see a city?